I found a bottle of Gilbey's Red Breast - John Jameson & Son's 10 Years Old Liqueur Whiskey in the cupboard. I was told that it is probably from the 60s or 70s. Would anyone have an idea of its value? Thanks for any information! Any chance you could post a picture. Late 60's Eary 70's is a good estimate. And I think the top end of my last estimate is a fair estimate, maybe €200-250 . Wait an see what others think but reckon I'm close enough. The problem with this however is you may not realise that on ebay. I've seen them got for less than 200Dollars in Ebay US. Yes that looks like the later bottling of Gilbey's Redbreast 10YO, bottled between mid 1960s and 1972/3. Jameson stopped supplying Gilbeys with the closure of the Bow Street Distillery in 1971. However Gilbeys continued to bottle Redbreast until 1985 following which Irish Distillers purchased the brand. A specialist retailer would sell that bottle for up to €300 (Insurance Value), but buy it for between €150 - €200. A fair collectors price would be around €200 - €240. Thanks to both of you for the information. Should I decide to offer the bottle for sale, I will certainly be in touch. I am located in Dublin. Musha if only the society was fully in order and it could be bought for the benefit of the members. argh!! Imagine a head to head of all the Redbreasts?? If you want an independent valuation you can always try Ally in the Celtic Whiskey Shop on Dawson Street for his opinion. Can we organise a whipround and buy this for the society if the owner sells? Let's see what price the owner would like, negotiate a deal, and then ten of us can split the cost and taste the whiskey? I be up for it too!! Well, that's three prepared to chip in already. I think this idea may be a runner! If the OP comes back with a price in mind, if indeed they would like to sell, then we might be able to bring this bottle into society hands! I'd also love to try it. Some of the guys on this forum buy and sell old whiskeys. Anyone got a spare they want to sell to a consortium? Not a PPS fan Michael? I've had one of these old one as well and thourghly enjoyed it. No i like pps alot. When we tried it (3 of us) we werent expecting much but what we got was awfull all 3 us couldnt even finish it, infact we actually gave the 3 glasses away to 3 other guys who couldnt drink it either. Might of been a bad bottle, but i think not. I wouldn't mind trying it either myself. Although there is a pub in Galway with a bottle, Tigh Neachtain, they flog it at E30 snots a glass, but the barman inside told me it tasted just like todays stuff. If its open a while it can really soften up, the old stuff had be different you'd think, being made with oats, wheat and rye as well. 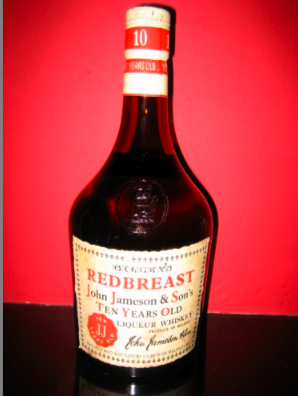 Any update on the 10 yr. old red breast, is it still with the original owner ? also suit my collection just fine. Sorry for the lapse of information regarding the Redbreast, but I have been out of the country. The bottle is still available for sale. Need to see if there are funds available in the Society for this. I had the last full shot of original Redbreast tonight in the Bull & Castle (there is still a half-shot left). Michael is right - horrible stuff. I refuse to believe they were all like that. I purchased the bottle advertised in this thread. I can confirm it is in excellent condition, with a very good fill level in the neck and likely little if any oxidisation looks to have occurred. I wonder if the bottle in the pub might have got a little oxidised over the years, especially if there was only a shot or two left in the bottle? Either way, the option remains open for the society to find out. We now seem to have the bare bones of a chronological Redbreast tasting at some point. jcskinner wrote: I purchased the bottle advertised in this thread. JC the bottle you bought is a 10yo so different to the 12yo's that seem to be in pubs all over the place. Therefore I reckon that this will be a much finer whiskey. The thinking is that the RB 12yos of the eighties were filled using the last remaining independently controlled stocks of Redbreast. There is a possibility that all stock over 12years was used and much older casks past their best may have been used in the mix or just in certain batches who knows. Therefore if there was a lot of over aged pps it may have brought down the quality. I am wondering though if the bottle that everybody talks about is just a dud that's been open too long. I've had a RB 12yo too and did not find it repulsive but I did not find it was anywhere near as good as current RB 12yo. I did find that it had this dull sweetness with the musty PPS character that we talk about with the older Midleton PPS however I also found that there was a kind of orange flavoured children's medicine quality to it too which was not very appealing.